Produced by David J. Wagner L.L.C. The Lindsay Wildlife Experience (Formerly the Alexander Lindsay Junior Museum and the Lindsay Wildlife Museum) is a much loved Bay Area institution where natural history, art, and environmental education meet. More than 50 species of live, non-releasable, native California animals are on exhibit, and the adjoining wildlife hospital treats and releases more than 5,000 injured or orphaned animals each year. 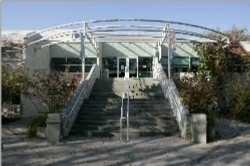 In September and October of 2015, this unique venue will host the debut presentation of "Andrew Denman: The Modern Wild." Meet the artist at the Saturday Gala Reception and Lecture program, and check back for further updates on workshops and tours associated with the artist's first major solo museum exhibition. 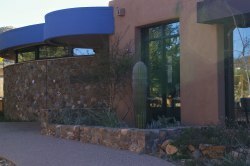 The Arizona-Sonora Desert Museum is a unique institution, part zoo, botanical gardens, wildlife rescue center, and art museum, its mission is to inspire people to live in harmony with the natural world by fostering love, appreciation, and understanding of the Sonoran Desert. The Desert Museum's Art Institute and its Ironwood Gallery promote conservation and education through the arts. In keeping with this vision, The Modern Wild will treat the greater Arizonan public to the artist's unique perspective on desert and other wildlife. The Hiram Blauvelt Art Museum is the legacy of the late Hiram Blauvelt, philanthropist, conservationist and collector. Through the contribution of his private wildlife art and big game collections, he hoped to promote the cultural value of wildlife art and the need for the conservation of its subjects. The Blauvelt was founded in 1957 as a natural history museum where students, scouts and youth groups learned about wildlife and habitats conservation while visiting artists created drawings and paintings from close observation of the specimens. Twenty-five years later, the Board of Directors of the Blauvelt-Demarest Foundation decided that the original objectives would be best achieved by redesigning the museum to feature the works of contemporary wildlife artists. Today the Blauvelt is one of only five wildlife art musuems in the United states. In the early years of the 21st Century, amidst growing interest in wildlife generated by a greater need for conservation than ever before, popular interest in wildlife art continues to broaden, and with it, a new trend is emerging: a movement away from the literal, illustrative style which typified so much of the 20th Century, towards a more interpretive, contemporary approach. Andrew Denman is at the leading edge of this evolution. His unique combination of hyperrealism with stylization and abstraction imbues his work with a strongly contemporary flavor that immediately distinguishes him from his peers. Over the last ten years, he has emerged as one of the most original voices in his field, a position solidified with awards, honors, and aquisitions by private collectors and museums alike. "Andrew Denman: The Modern Wild" is the first ever solo museum exhibition of the artist's work. Thirty-five original paintings as well as preparatory studies, drawings, and photographs, will showcase Denman's artistic evolution and art-making process. Visitors to this exhibition will find themselves captivated, challenged, and informed by images that push the boundaries of the wildlife art genre. A poet as well as a painter, Denman uses nature's innumerable inspirations not as a template for illustrative mimicry, but as a springboard for metaphore seldom seen in animal art. David J. Wagner, Ph.D., author of American Wildlife Art and curator of such notable traveling museum exhibitions as "The Art of Robert Bateman," "Biodiversity in the Art of Carel Pieter Brest van Kempen," and "Kent Ulberg: A Retrospective," now enters the next chapter in his scholarly exegesis of this fascinating genre with "Andrew Denman: The Modern Wild." Both Dr. Wagner and Andrew Denman are excited to bring this collection of the artist's work into the public eye. A lot of artists will come and ask us to represent them, but in some cases I reach out to artists I admire. In this case, I reached out to Andrew because he shows an incredible imagination and creativity in his work. He's more than a wildlife artist. In this day and age there's a lot of cookie-cutter work. Andrew's work takes wildlife art a step further. It shows the interrelatedness of people and nature. So much work today has been to set wildlife against a backdrop of pristine wilderness. The world isn't really like that anymore. His work is a meta-level above other work. President of David J. Wagner, LLC. On first viewing, Andrew's innovative compositions and exceptional artistic skill were self-evident. I started following his work and soon saw a painting that �spoke to me�. The Answer still speaks with each revisit. He's an extraordinary Bird painter, and then I saw his paintings where he sets birds against interesting design backgrounds and that combination of realism and geometric art is a genre that appeals to me enormously. It's dynamic to see the combination of the two. The creative spark that set tightly and accurately painted owls as a camouflage against the flour de lis wallpaper is something I haven't seen before. It's creative, fascinating, and beautiful. The way the graphical illustration component is in harmony with the birds shows his particular genius. He creates fun, satisfying and brilliant pieces. It's a reminder to me that artists see the world differently from the rest of us." I�ve interviewed hundreds of artists in my capacity as senior editor of Western Art Collector magazine and Andrew is among the most articulate and organized painters I�ve had the pleasure to speak with. His unique combination of hyper-realism, stylization and abstraction compliment his subject matter, leaving viewers wanting more. Collectors and casual fans of this genre must add a Denman to their holdings to complete their collection. I enjoy Andrew�s approach to his subjects, which often challenges the viewer and that�s a good thing. Andrew possesses an enviable mastery of his medium and also demonstrates a sophisticated and skillful drawing technique. I expect and look forward to continued good work from Andrew and an array of surprises, too. [T]he study of Piet Mondrian, Robert Bateman, Ray Harris-Ching, William Harnett, John Haberle, August Rodin, Salvador Dali, and Hieronymus Bosch fostered an eclectic mixture of the representational, the abstract and love of the natural, which meet, merge, and marry on Denman�s canvases. No great artist sees things as they really are; they interpret their observations and blend them with their thoughts and beliefs. When done well the result is something of immense beauty layered with narrative. Andrew Denman is such an artist, his work is contemporary, his chosen subject the natural world and at a time when so much contemporary art is preoccupied with ugliness his has a gentle beauty that resonates with the soul.